In recent history one of the all time most popular Batman shows was and still is, ‘Batman: The animated Series’ which was created by Bruce Timm and Paul Dini. Associated with this series were a host of other shows that eventually formed the DC animated universe. Even with the huge success of ‘Batman: the animated series’ the innovation evolved bringing the fans ‘Batman Beyond’ which was set in the future. The show was centred around Terry McGinnis who is trained and mentored by an older Bruce Wayne. 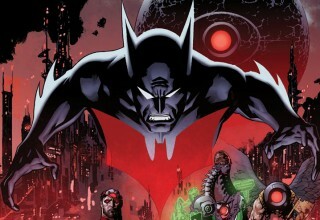 Today the show is still popular and Terry McGinnis is centred within the recent digital title, ‘Batman Beyond 2.0’. Given all this though, the character has not been part of the popular DC Universe fans have grown to love. Until now. Terry McGinnis will now be part of the new weekly instalments of, ‘Future’s End’. Kyle Higgins (Batman Beyond 2.0 writer) recently confirmed the good news in an interview saying that the image of “Batman” in the awesome cover art designed by Ryan Sook is in fact Terry McGinnis (below). Let’s welcome Terry McGinnis to the DC Universe! Brian Azzarello confirmed that Terry McGinnis would be returning saying, “I just needed a character from the future”.